Previously announced as Guy Guy Girl, the romantic comedy Shall We Do It Again (working title) began shooting on May 10. Rising star Park Gyeong-hye has joined the cast which already confirmed the participation of KWON Sang-woo, LEE Jung-hyun and LEE Jong-hyeuk. 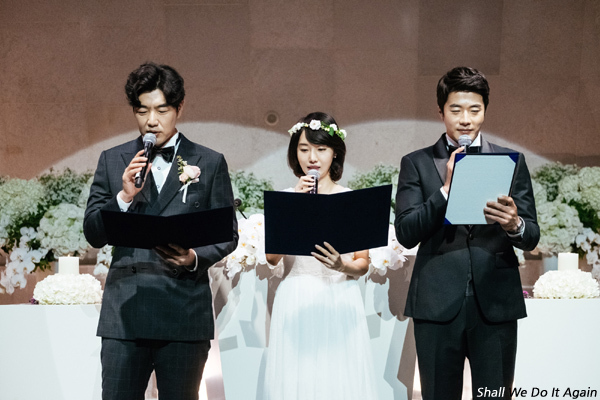 The three main stars play a three-person couple that holds a special ceremony on Couple’s Day. PARK will feature as a nurse who works in the clinic of the veterinarian played by LEE Jong-hyeuk. A new face on the scene, Park Gyeong-hye has been drawing fierce attention after appearing in a raft of notable films of late. She featured in the acclaimed indie Jane (2017) before being cast in the man-on-the-run thriller Fabricated City (2017) and then the hit political drama 1987: When the Day Comes (2017). She has also completed filming a role in the upcoming crime drama The Drug King, which features SONG Kang-ho in the lead. Meanwhile, KWON Sang-woo is back on screens this week in investigative comedy sequel The Accidental Detective 2: In Action. LEE Jung-hyun last appeared in RYOO Seung-wan’s big-budget action drama The Battleship Island (2017) while LEE Jong-hyeuk was recently seen in the family drama Notebook from Notebook from My Mother. PARK Yong-jip was last in the director’s chair for the thriller The File (2015), also featuring LEE Jong-hyeuk. The film is expected to open in the second half of this year.